Until the last decade or so, dental patients who were facing total tooth loss had few options for restoring their smiles. Today, patients with partial or total tooth loss have more and better options for restorative dental care, thanks to advancements in dental science and improvements in materials and prosthetics. At Primo Smiles, we help patients regain oral function and much improved aesthetic with traditional dentures and implant dentures in Cynthiana, KY.
Dentures have long been the go-to choice to solve the loss of one or more teeth. Dentures are cost-effective, minimally invasive, and help you get a full smile without the need for oral surgery. Partial dentures look something like retainers, with faux teeth attached. When you wear the appliance, your replacement teeth fill in the gaps caused by tooth loss and allow you to smile with confidence. Full dentures are meant to solve the problem of total tooth loss in the upper or lower arch of teeth, or even both for some patients. 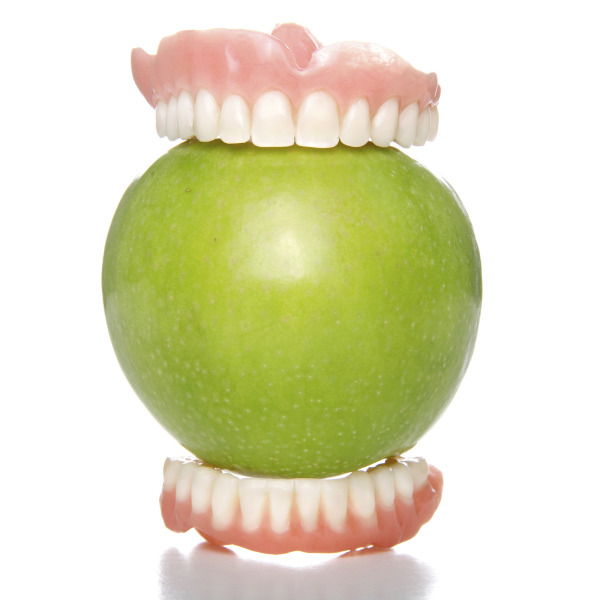 A full denture is sized to fit you comfortably and is made to look like your own natural teeth. Our restorative dentist, Dr. Christopher Kerns, helps design your dentures to be as natural and comfortable as possible. Once your set of dentures is created at a trusted local dental lab, you’ll visit our office to have a final adjustment and fitting. You can leave our office that day with a brand-new smile. Unlike removable dentures, implant dentures, or fixed dentures, are secured by dental implants posts. These posts, which look like small screws, are surgically placed in strategic locations on either jaw arch to support your replacement teeth. After healing from implant placement surgery, the posts will have naturally integrated with bone in your jaw, giving you a strong base for your dentures. Because implant dentures are permanently retained, our Cynthiana denture patients don’t have to deal with loose prosthetics or daily application of denture adhesive. Getting implant dentures greatly increases oral function and restores natural facial aesthetics. In the event that you need a denture immediately, we offer same-day immediate dentures; your denture can be attached the same day that your implants are placed. This treatment option is available depending on your needs and expected results. Dr. Kerns helps every patient make the treatment decisions that will best benefit their oral health and help them meet their treatment goals. You don’t have deal with the repercussions of missing teeth. Dr. Kerns and his team provide you with effective solutions for replacing missing or extracted teeth. Contact our dental office today to schedule your denture or implant-supported denture consultation.